Some time ago in my post on logistic regression, I talked about the problem where you have a matrix representing data points with features, and a vector of classifications. In linear regression you would produce a vector so that , but the problem here is that our output could be any real number, not . The solution we investigated was using the logistic link function which turns any real number into something we interpret as a probability. That was one solution, another even simpler one is the function defined . It is convenient in this case to think of the response as taking values in not . Previously we added a column of ones to in order to create an intercept term, here we will write it separately so so that where is called the bias. This post will take the book ‘The Elements of Statistical Learning’ as its guide (the section starting on p. 130), which is freely available online, but there is also a great blog post about it here. So define , we classify a point as being in the positive class if and negative if . Geometrically we have an affine hyperplane , and points are classified depending on whether they are ‘above’ or ‘below’ the hyperplane. The unit normal to is given by , points above then mean points with positive projection onto this vector. notice this means that is proportional to the signed distance of from . where is the response of , notice that this makes each summand negative, which is reversed by the minus sign outside. Just like in logistic regression, we can use these partial derivatives to search for a minimum of . The algorithm purposed by Frank Rosenblatt, the inventor of the perceptron, is to modify the hyperplane after looking at each individual misclassified item in as it comes, that is , where is the learning rate. This has the advantage of being much faster than computing the global gradient informed by all of the data, and is an example of stochastic gradient descent. Of course by changing the hyperplane as we go we may change , and so what we actually do is iterate over each datapoint in a fixed order, and check if it is misclassified under the latest hyperplane, then update and move onto the next point. This is then very easy to code. First let’s recycle some code we used for logistic regression to get some test data. #First we grab some random x-values in the range [a,b]. #Sorting them seems to make the plots work better later on. 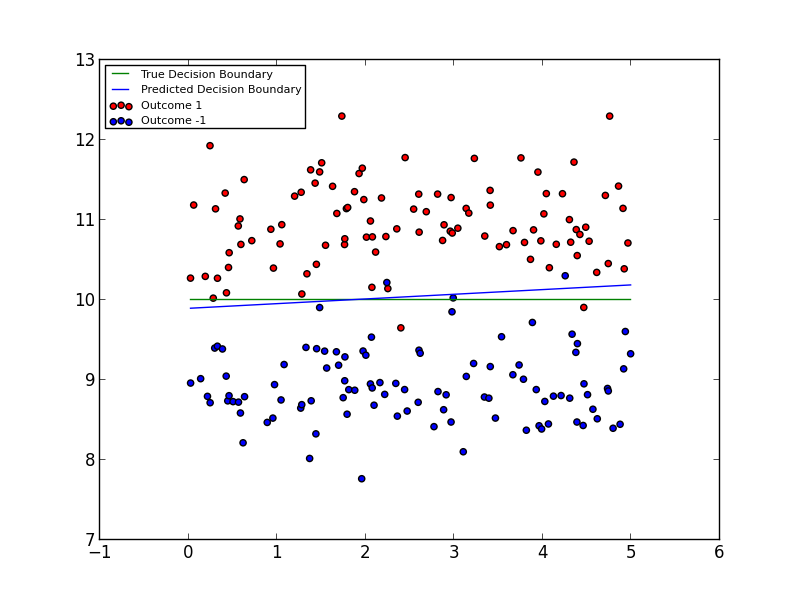 #Now we define our linear function that will underly our synthetic dataset: the true decision   boundary. #B points are given by g(x) minus a Gaussian norm term with positive mean. X2= #This will hold the y-coordinates of our data. Y=  #This will hold the classification of our data. #Now we combine the input data into a single matrix. #Now we return the input, output, and true decision boundary. Fairly straightforward stuff I hope! If not then it should make sense when we plot it. Now to implement the algorithm. if (X[row,:].dot(weight)+bias)*y[row] <=0: #Misclassified point. we shuffle the order we take the data points in at each step to get rid of any peculiarities in the order we update. Now let’s try it on our test data. Not bad! Get the code here. 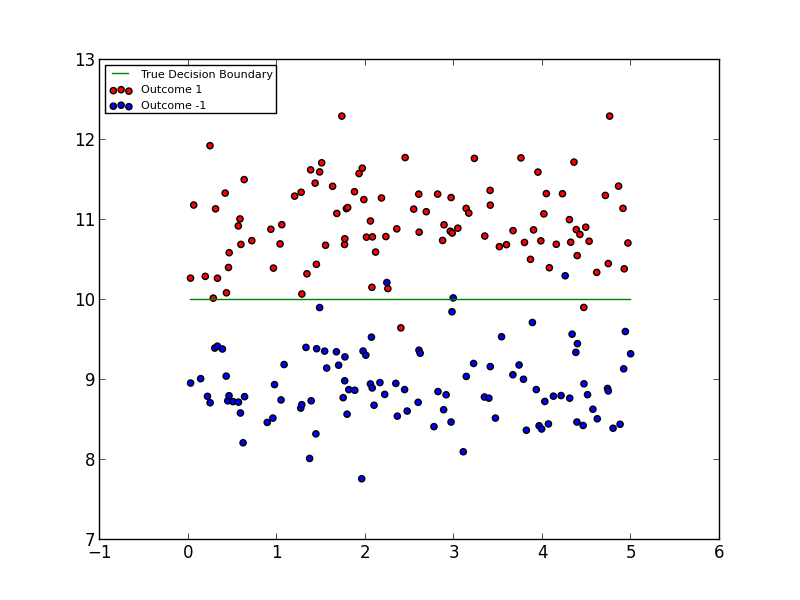 By triangleinequality in machine learning on February 24, 2014 .